The Mirena Intrauterine Device is a small, plastic T-shaped device that is inserted into the uterus. It uses topical delivery of progestin to the uterine cavity to prevent pregnancy. The Mirena also helps control heavy, painful cycles. It can remain in place for up to five years, but can be removed earlier with a quick return to fertility. Side effects include altered bleeding patterns for several months, cramping with insertion, IUD expulsion, and a small risk of uterine perforation upon insertion. 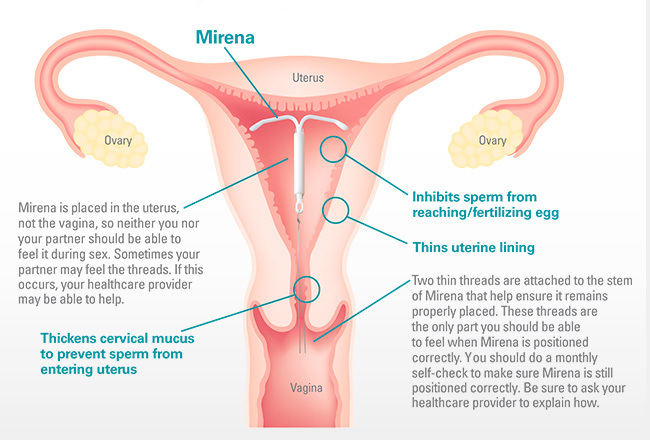 The Mirena is available to all women, regardless of pregnancy history. You should not get an IUD if you have cervical or uterine cancer, pelvic inflammatory disease, or a distorted uterine cavity. Kyleena is the newest IUD on the market and differs slightly from some of the other IUDs that have already been widely used. It was created by the makers of the Mirena IUD and features many similarities to it. Here are some quick facts about the Kyleena. You might be wondering how to choose between all the different IUDs available on the market. Here is a quick cheat sheet comparing the more commonly used IUDs – The Mirena, Skyla, and Kyleena.